The larger the download, the slower the experience. Not everyone has a 20Mb connection and this is especially true in developed western countries with aging copper infrastructures. It doesn’t matter how good your site is: users will not wait. I predicted page weight will drop this year — and I hope not to be proved wrong. Fortunately, there are a number of quick fixes which will have an instant effect on site performance. All these techniques are well known, use today’s technologies, do not take considerable time, and can be implemented on an existing codebase without the need for redevelopment. Later on I’ll move on to more advanced techniques, then outline some tools to help you measure your success. According to W3Techs.com, almost half of all websites do not enable compression. This is normally a server setting which should be enabled by your web host, although it may be possible to configure it yourself. If the browser can easily cache a file, it won’t necessarily need to download it again. Simple solutions include setting an appropriate Expires header, Last-Modified date or adopting ETags in the HTTP header. Even if you’ve switched to the correct format and resized the dimensions, it’s possible to shrink image files further using tools that analyze and optimize the graphic. These include OptiPNG, PNGOUT, jpegtran and jpegoptim. Most can be installed as standalone executables or integrated into your build process. Alternatively, online tools such as Smush.it can do the work in the cloud. I suspect many sites can reduce their weight by 30-50% with a few hours of effort from a non-developer. For the average site, that’s a saving of more than 800Kb and it’ll become noticeably faster. But if your pages are still obese after following those steps, there are more drastic dieting options you can contemplate. While simple buttons won’t show click statistics, you can discover far more information with event tracking in Google Analytics. Presume you’re showing a video hosted by a specialist provider. While the video is downloaded only when the user hits “play”, you are probably loading video API code and other related resources regardless of whether the user plays the video or not. Why not load all that content when the user requests it? You can also consider on-demand images and content that download as the user scrolls the page. I’m not a fan of the technique; it can potentially have a negative impact on usability or SEO. 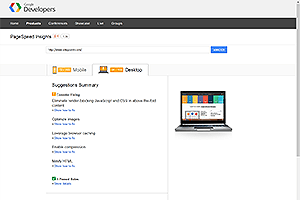 However, it is useful for some types of web applications–for example image galleries. Are you slicing images to create gradients, rounded borders and shadows? I hope not — CSS3 makes such techniques redundant. The effects won’t work in IE8 and below but oldIEs are dying and users won’t be aware because they won’t compare your site in multiple browsers. You can add clever shims such as CSS3 PIE but I wouldn’t recommend it: they can bulk up your page and make the older browsers slow to a crawl. CSS3 effects generally degrade gracefully so it’s rare you need worry about older browsers. Pixel perfection has always been futile and is utterly ridiculous when you’re building responsive designs that adapt to different screen sizes. A note of caution though: CSS shadows and gradients have been shown to be costly during browser repaints, especially if you’re displaying dozens of elements with these features added. So use the effects sparingly and test scrolling performance and repaints before committing to overusing these effects to replace images. CSS3 animation is easier to write and requires significantly less code. SVGs contain points, lines, and shapes defined as vectors in XML. SVGs are ideal for responsive designs since they will scale to any size without loss of quality and the file size is often smaller than a bitmap. There are tools that convert bitmaps to vector format, but starting from scratch will yield the best results. Packages such as Illustrator, Inkscape, and SVG edit provide a good start, although learning XML basics will help you produce cleaner code. You may have dozens of small icons in use throughout your site and managing individual image files isn’t fun. Fortunately, icon fonts can save space and sanity. A single font can contain hundreds of vector-based images which can be set to any color and scaled to any size in all browsers (going back to IE6). You can use a dedicated font or, for optimal bandwidth-saving, use a tool such as Fontello, IcoMoon or Flaticon to create a font pack containing the icons you need. Bitmap images should be the last choice once CSS3, SVG and icon font options have been rejected. Often-used bitmaps can be packaged into a single sprite file so individual images can be accessed in CSS, e.g. You require a single HTTP request to load the sprite. A single sprite will normally result in a smaller overall file size than the total weight of the individual images. All images appear when the sprite has loaded. Image sprites can be created in a graphics package or using tools such as Sprite-Cow and Instant Sprite. You can alternatively incorporate sprite production in your Grunt workflow. This will reduce the number of HTTP requests — although maintenance is more difficult unless you can automate the process in some way. I would only recommend it for small, often-used images that are unlikely to change. Tools such as DataURL.net and data: URI Generator will convert files to data URIs for you. You won’t know whether your diet has been successful unless you’re monitoring your page weight and the resulting download speed improvements. 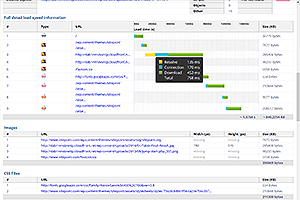 Browser developer consoles and free online tools such as Google Page Speed Insights can help. A comprehensive list is coming in my next article before we discuss more radical, liposuction-like page weight reduction techniques in the last part of this series. Would you grant an unknown developer unfettered access to your website code? If not, why are you trusting third-party code? It’s easy to add useful widgets to your page and it’s rare they’ll compromise security. That said, always check what resources they’re pulling in. For example, social network buttons can add half a megabyte of content, making your pages slower; can you do without them? Perhaps you’re using jQuery. That’s fine — stick with it. But don’t then browse the Prototype or YUI plug-in libraries looking for cool widgets and effects. Can you obtain a custom build if you’re not using all features provided in a library? Are there lightweight alternatives, such as Zepto.js or Minified.js which provide API-parity with core jQuery methods? Is a library required? If it’s primarily being used to smooth over browser inconsistencies, perhaps those issues no longer exist. Are you using a library because it’s familiar and comforting? 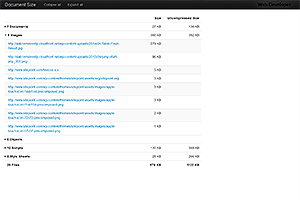 Few Content Management Systems generate overweight pages … but then you start adding stuff. A free or commercial template can make financial sense. Why employ a developer when off-the-shelf code does everything you need for a few dollars? They can be ideal for simple brochure sites, but there’s a hidden cost. Generic templates must sell hundreds, if not thousands of copies to recoup the development effort. To attract buyers, developers bundle every feature they can; you may only use a fraction of them but they still exist in page code. Perhaps I’ve been unlucky, but the WordPress themes I’ve experienced often weigh in at more than 2Mb. I’m sure there are lightweight options, but finding one is another matter. Personally, I prefer the lego-like modular approach in web development (that’s classic lego blocks rather than the packs that limit you to building one specific thing). You start with nothing and add required components. Frameworks are more like sculpturing in marble; you chip away at the parts you don’t need until the site’s complete. That’s what should happen — but it’s easier to leave stuff in. I won’t say “don’t use frameworks”, but be aware of the additional bulk they carry. A tool such as grunt-uncss can help remove unnecessary code but never adding the framework code in the first place may be preferable. Progressive enhancement rarely incurs significant additional effort; it’s a development approach rather than a technology. Web applications have the ability to work offline using the the HTML AppCache. It’s possible to use the AppCache to supplement or enhance browser caching of regularly-used assets. Fortunately, a little user testing can help you identify never-used options which can be ripped out of the product or replaced with sleeker, lightweight alternatives. Who’s to blame for the average webpage reaching 1.7Mb? Developers. It doesn’t matter how or why a website became obese; a developer let it happen. Of course, development speed and cost-cutting is important — but not if the result is a slow, clunky product that’s never used. Your client/boss may not understand the technical issues but, if you don’t highlight potential pitfalls in layman’s terms, you’ll never become a conscientious coder earning the respect and rewards you deserve. It’s easy to forget bandwidth issues when you’re sitting on a fast 50Mbps connection. Limit connectivity or try loading your site in an area with poor 3G reception or on a busy hotel wifi network. Your frustration could be experienced by thousands of users every day. Change your attitude. Webpage obesity is an epidemic but it’s evident few developers care. Creating slimline pages is a valuable skill that will help you stand out from the crowd. Pingdom is one of my favorite online tools. It reveals everything you could possibly need to know: page weight, download speed, code analysis, performance grades, development suggestions and even a historical timeline to record your dieting progress. If you only use one analysis tool, Pingdom should be it. Chris Pederick’s Web Developer toolbar has been around since the dawn of creation (of Firefox). To use it to view both the compressed and uncompressed page size, select View Document Size from the Information menu. Note that Web Developer is available as a Chrome extension but, unfortunately, doesn’t have this feature. 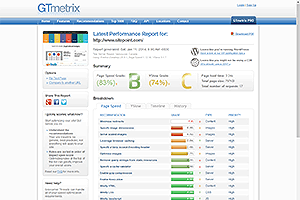 GTmetrix shows an aggregated report generated from Google’s PageSpeed Insights and YSlow as well as additional information such as the total page size and number of requests. The online tool is better than both systems, although you can still use them separately. 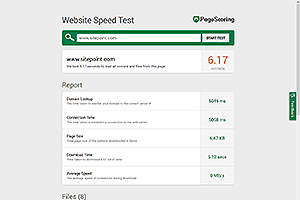 PageSpeed Insights doesn’t show total page weight or download speed statistics but it does indicate where you can make improvements for both desktop and mobile devices. 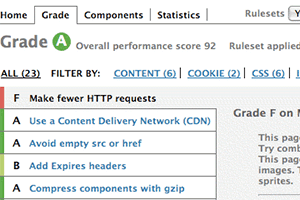 Sites are allocated a score out of 100 so you can quickly evaluate how improvements are progressing. Yahoo’s YSlow is an online tool and plug-in available for most browsers. Like PageSpeed Insights, it evaluates pages and issues a grade between A (you’ve done everything you can) and F (you’re failing dismally) for a range of factors. If you don’t want to use anything new, Firebug, Chrome Inspector, Firefox Web Developer and IE Developer tools all offer network analyzers and profilers to help assess the size of your pages. Note they won’t necessarily download cached assets so you may need to use Ctrl+F5 or clear the cache prior to testing. 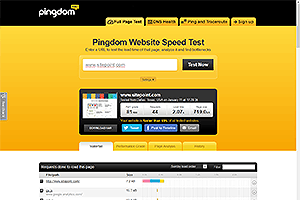 If you require a quick and easy tool, Website Speed Test does the job. It concentrates on download time but file sizes are also displayed, along with the download time for each individual file which could be handy to isolate problem areas. 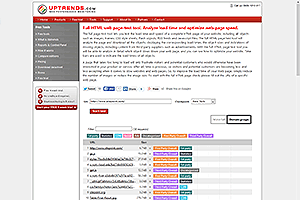 As well as the usual size and download speed tests, the Uptrends tool is unique in that it allows you to test responsiveness from specific geographic locations. The report also highlights which domain each resource is served from to help assess CDN effectiveness. 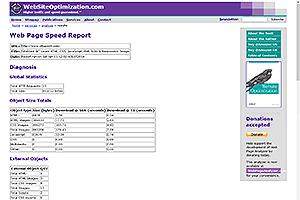 Page Speed Tool is well-presented and highlights file sizes, assets, resource groups, and download speeds. 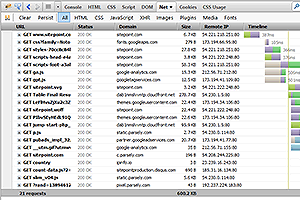 Note that the estimated load time appears to be calculated for the HTML source only — not for all files. However, you can get a good estimate of total load time by examining the accompanying waterfall chart that’s generated. If you can forgive its age and the dated purple and orange design, Web Page Analyzer provides a range of file size statistics as well as download time estimation for modems going all the way back to 14.4K! I hope you found this exhaustive guide useful, and at least a few of the solutions presented helped trim the fat. Best of luck with your new weight-loss regime!